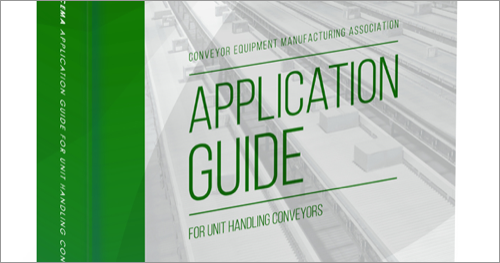 The most comprehensive technical resource and education guide available for the Conveyor and Intralogistics Industries. What’s New? 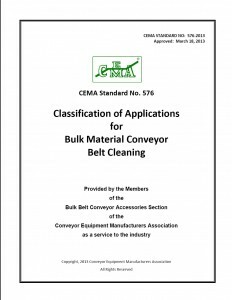 CEMA’s mission is to provide the industry best practices in the design, application, and safe operation of conveying equipment. 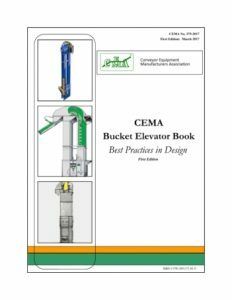 This book is the product of CEMA’s Members combined efforts in addressing the characteristics of bucket elevators, i.e. 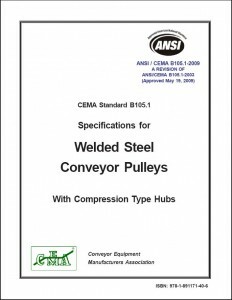 selection, horsepower, calculations, casings, buckets, pulleys, chains, sprockets, and safety information. 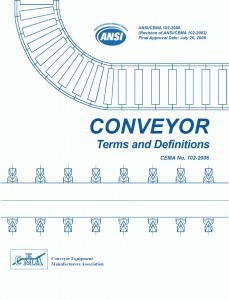 This standard lists and defines over 1,500 terms applying to conveyors, conveyor systems, and allied equipment. 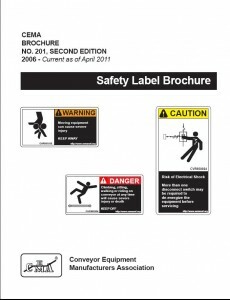 The purpose of this brochure is to identify Danger, Warning, and Caution Safety Labels which identify known potential hazards. 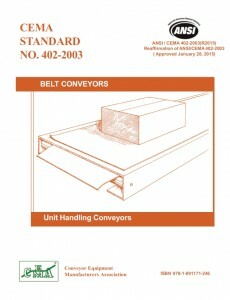 It also includes Safety Label Placement Guidelines for conveyor equipment. Receive our most current newsletters, announcements on industry related events, statistics and more. 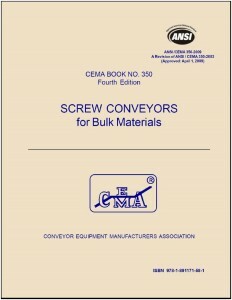 Includes a series of recommended dimensional standards for major screw conveyor components. 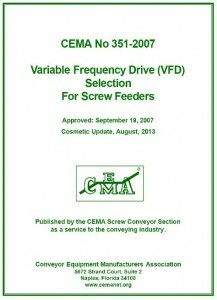 This standard contains procedures for calculating demand horsepower for screw feeders and procedures. 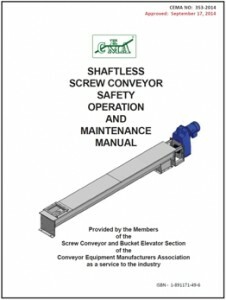 This manual contains instructions for the safe installation, operation, and maintenance of screw conveyors.This publication is a free download for members. 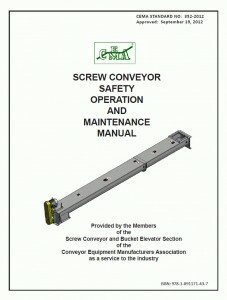 This manual contains instructions for the safe installation, operation, and maintenance of screw conveyors. 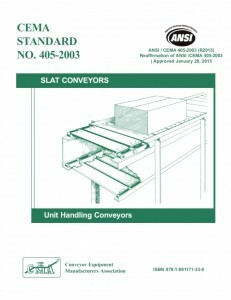 This standard, the second in a series on unit handling conveyors, establishes recommended design and application engineering practice for unit handling belt conveyors. 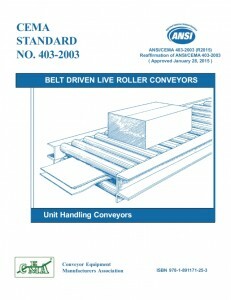 This standard, third in the unit handling series, establishes recommended design and application engineering practice for belt driven live roller conveyors. 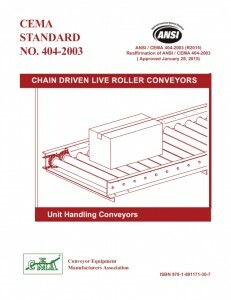 This standard, fourth in the series, establishes recommended design and application engineering practice for chain driven live roller conveyor. 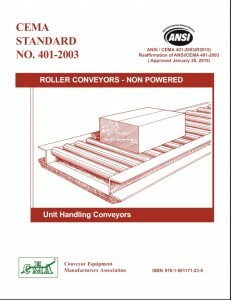 This standard, fifth in the series pertaining to unit handling conveyors, proposes certain minimum standards for use in the design and application of slat conveyors. 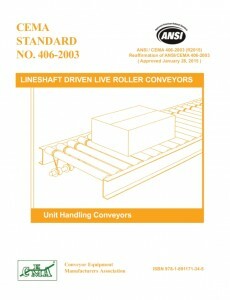 This standard, sixth in the series pertaining to unit handling conveyors, establishes recommended minimum standards for use in manufacturing and applying lineshaft live roller conveyors. 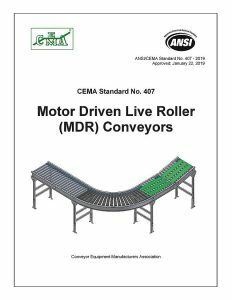 This standard, seventh in the series pertaining to unit handling conveyors, it establishes recommended minimum standards for use in design and application of motor driven live roller conveyor. 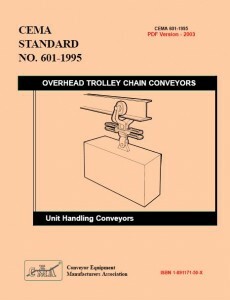 These trolleys are extremely flexible material, used in practically every industry worldwide. They can be installed to follow almost any path, changing direction vertically or horizontally. Use multiple drives, and/or single paths. This publication is also known as ‘7th ed. 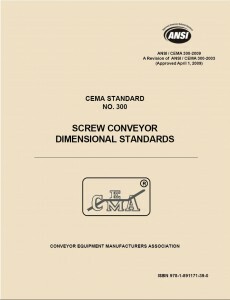 APPENDIX D, in CEMA’s Belt Book. 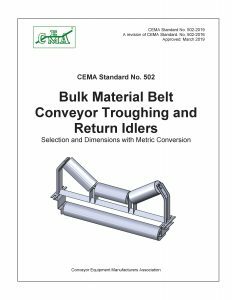 It outlines minimum standards for installation of bulk belt conveyors and suggestions for meeting or exceeding these standards. With Metric Conversion. 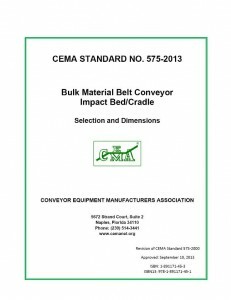 This publication assures the users of conveyor impact beds/cradles that an impact bed/cradle is dimensionally compatible with conveyor idlers manufactured to the CEMA Standard No. 502. With Metric Conversion. 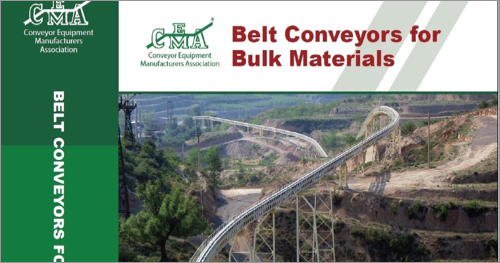 This publication has been established to provide a uniform method for determining the application class of any individual belt conveyor. 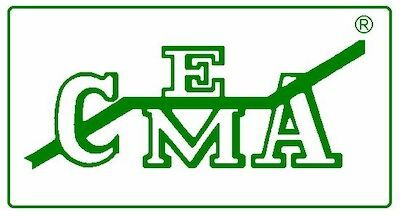 Please see CEMA store for detail on Technical changes in the PDF. With Metric Conversion. 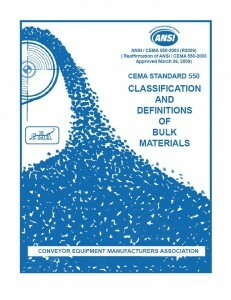 Standard for CEMA class B, C, D, E & F troughing, return and picking idlers. With Metric Conversion. 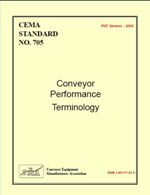 This publication provides recommended load ratings, dimensional information, and criteria for selection of welded steel conveyor pulleys. With Metric Conversion. 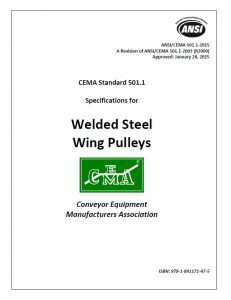 This standard provides recommended load ratings, dimensional information, and criteria for selection of welded steel wing pulleys. 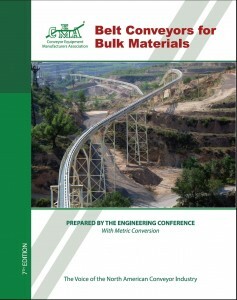 This hands-on reference provides up-to-date guidance on the selection, design, utilization, and maintenance of various types of chains. 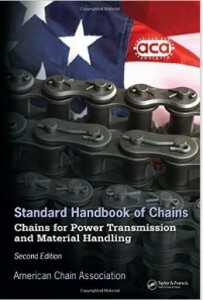 It authoritatively covers the use of chains in various application environments, terminology, safety procedures, and the history of chains. 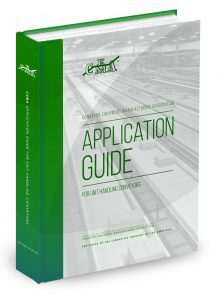 Download the handbook ERRATA.